Dieffenbachia are a family of hardy, wide leafed plants grown for the ornamental patterns in their foliage. Also known as the "Dumb Cane" due to its supposed effect of making speaking difficult if ingested, Dieffenbachia are mildy toxic plants that can cause swelling and irritation if swallowed. 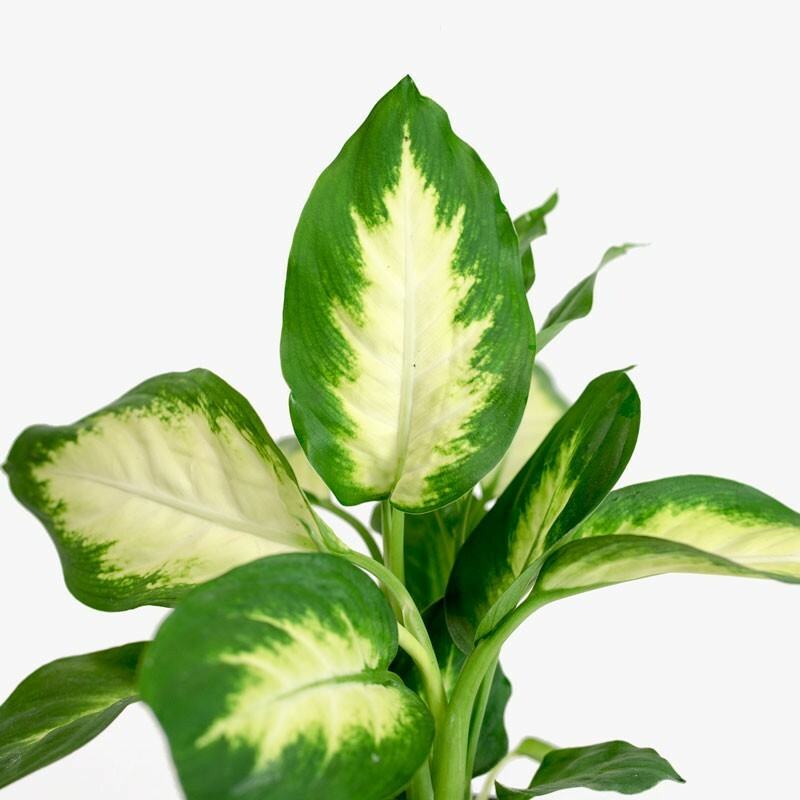 The Dieffenbachia does best in high light situations, but can get by in medium light after an adjustment period. They typically shed leaves immediately after being transplanted, but will sprout new growth at a rapid rate, so any yellowing leaves can be pruned away worry-free. They do not respond well to overwatering, so err on the side of caution when giving them a drink. A hardy tried and true houseplant native to the tropics of Mexico and the West Indies. This plant is toxic if ingested, so place it out of reach of pets and children. Please note, the Dieffenbachia endures a more dramatic transplant shock. It may lose a few leaves initially, but should stabilize in a week or two. Bright indirect light, to full indoor sunlight. Be sure to water your plant upon delivery. Dieffenbachia like moderately moist soil, but prefer to let their top layer of soil dry out between waterings. When underwatered, the leaves will droop and turn yellow. When overwatered, the stalks of the leaves will turn slimy and slake off. Moderation is key. Dieffenbachia appreciate an occasional gentle misting.